The Abbey is a clerical complex rising on a mountain top. A large wall surrounds a dozen of buildings and a narrow and dangerous way leads to the complex. Perfect to host a mystery adventure using as guideline “The Name Of The Rose” a novel from Umberto Eco, it can however be adapted to any use for your campaign. 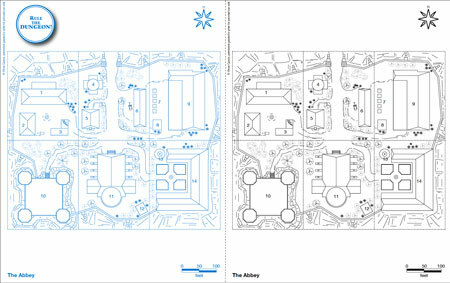 This Blueprint contains seven maps detailing the Abbey. 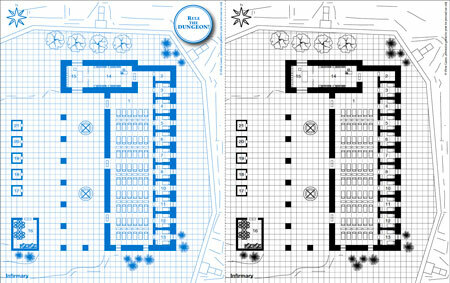 Six maps can be joined to form a large one (25.5x22 inches map), while one map provides an overall view of the complex.